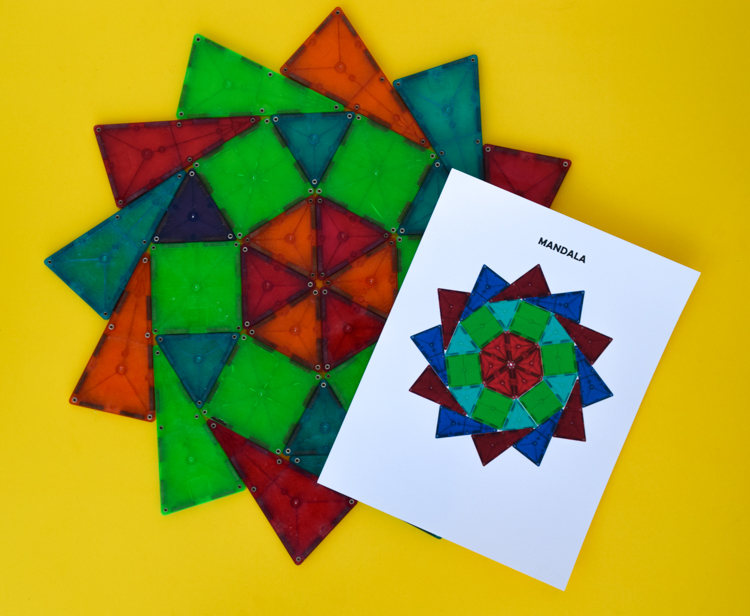 Looking for Magna Tile ideas for kids to build? 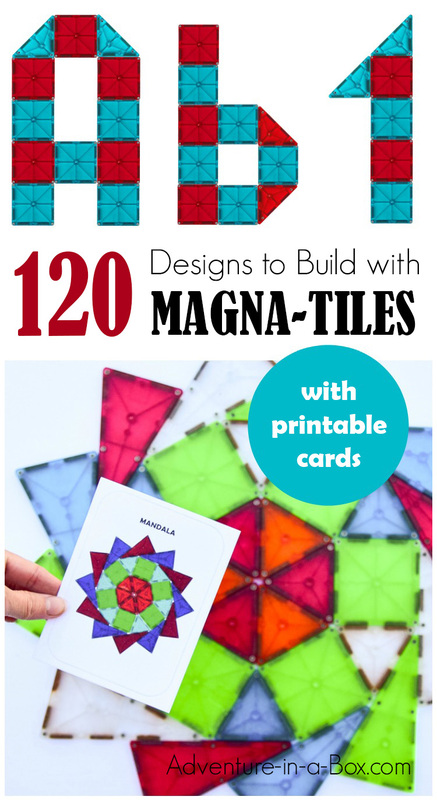 Choose one of 120 printable Magna Tile designs and build away! There are letters, numbers, geometric shapes and 2D art designs. No matter how exciting and engaging at first, most toys eventually fall out of favour. Sometimes interest comes back after a break. 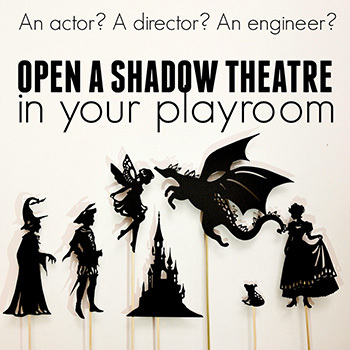 And other times, there needs to be a prompt, a challenge, a new way to look at an old toy. Magna Tiles have been a firm favourite in our house for over three years now. There were months when they were taken out of their box every day, and there were also months when the kids didn’t play with magnetic blocks much. 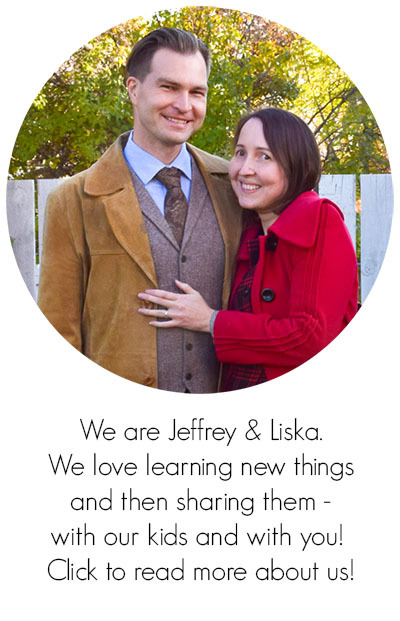 Very often though, the return of their interest coincided with finding one of those printable design cards that I had made for them in the past. They would try to replicate the design, and in no time they would be sucked into the world of magnetic play all over again. Even as I was taking photographs of some of the cards for this post, they got attracted to the activity. You will be able to see their hands on some of the pictures, busily working on solving the magnetic puzzles. 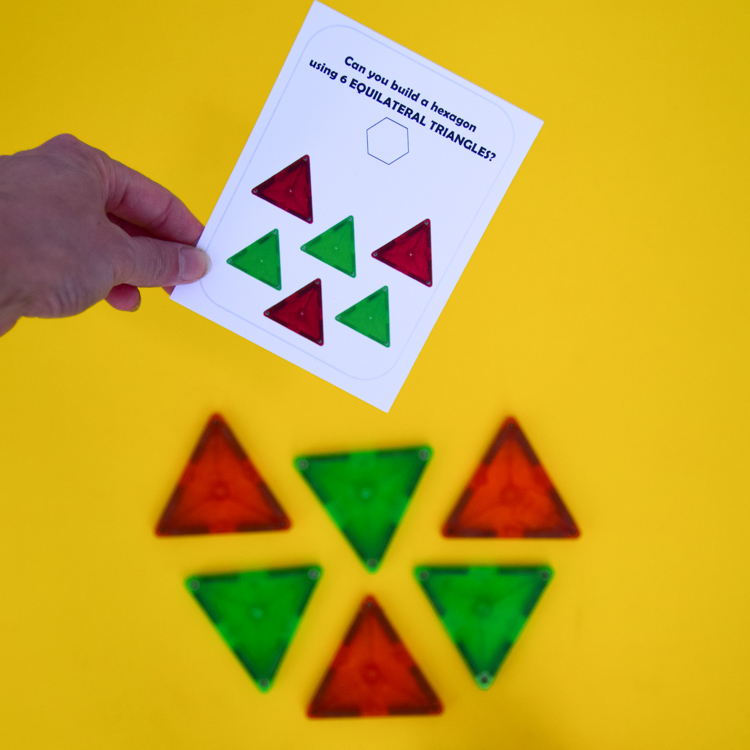 Yes, they do treat these Magna Tile idea cards as puzzles. They’re capable of coming up with their own designs, but there is a certain challenge involved in repeating the pattern on the cards that appeals to them in a different way. 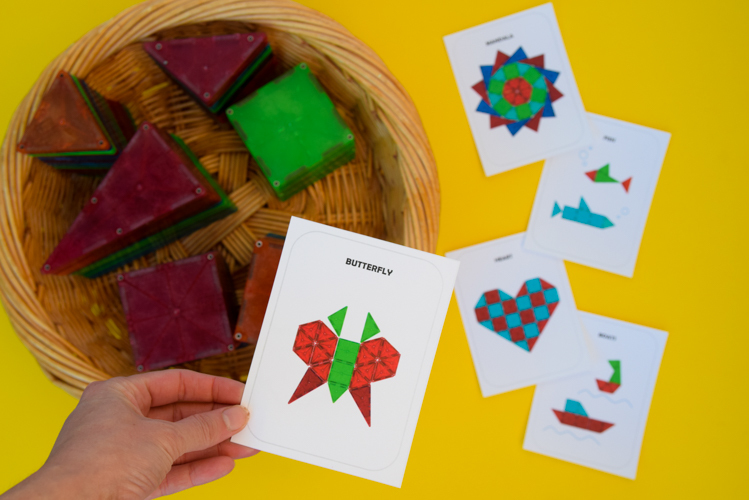 While playing with Magna Tiles develops creativity, working on cards helps with problem solving skills. There is a certain sense of satisfaction for the kids when they get the design right – they have solved the problem! 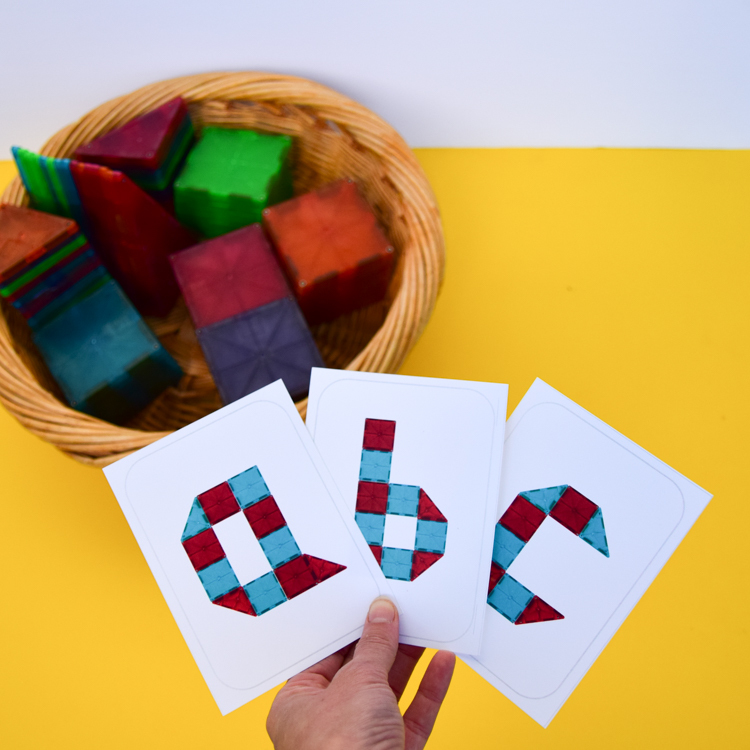 We made the first Magna Tile idea cards shortly after my son turned three – they featured uppercase letters of the alphabet. Being a very hands-on kid, who likes to make whatever he is learning about, he asked me to build a couple of letters for him. Eventually, we did the whole alphabet, and I photographed it, so that he could come back and make the letters again. After that, we made lowercase letters, numbers, geometric shapes, and 2D designs. There are 120 designs in total, and they come in different scales. 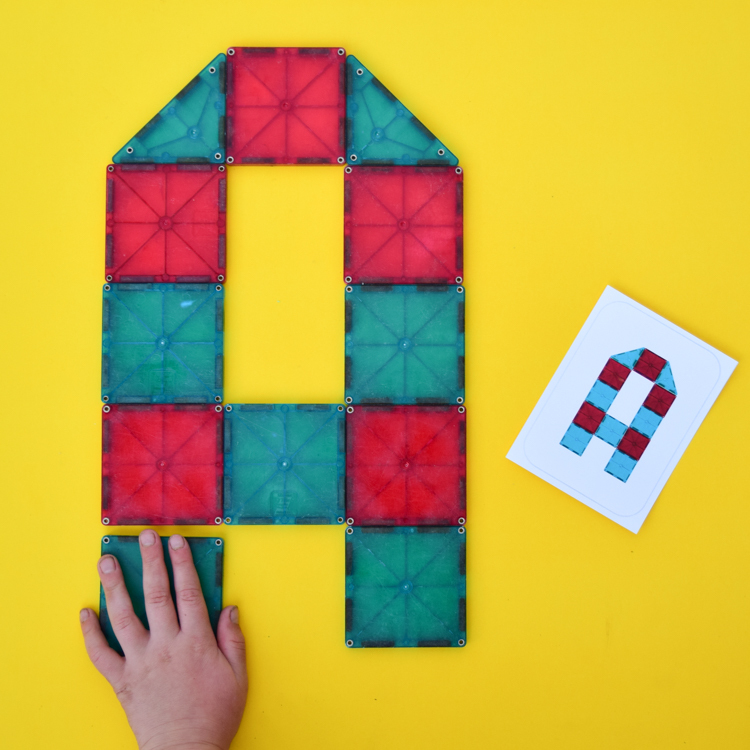 Alphabet Magna Tile cards (both uppercase and lowercase) are great for including in preschool or kindergarten literacy centres, whether in a homeschool or a traditional classroom. They actually work great for a Montessori environment! 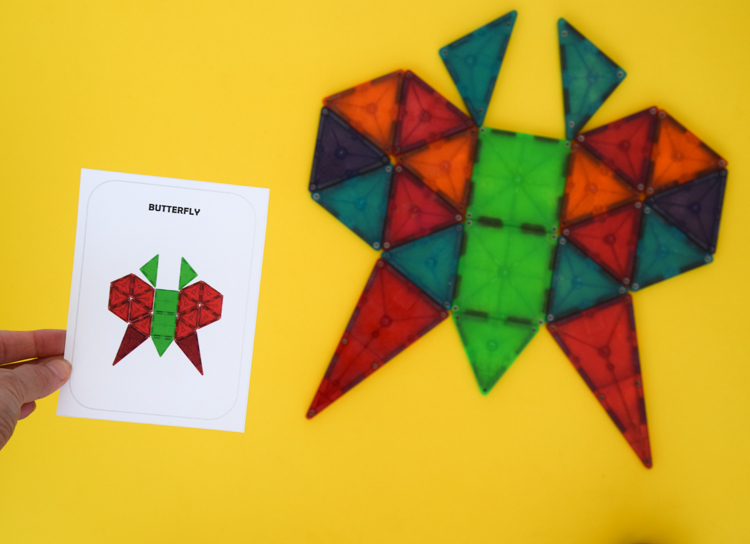 Everything in this activity is neatly contained, and children can easily check their work according to the printable designs. 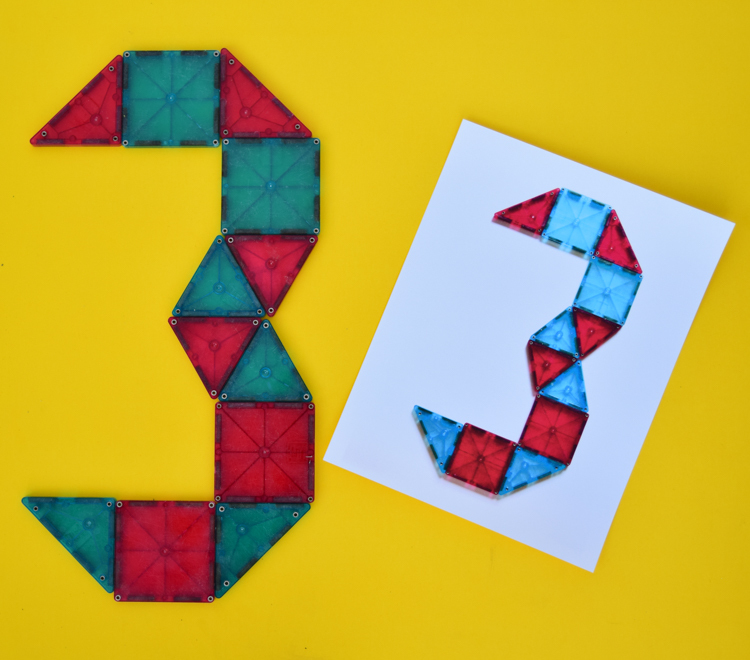 Number and geometric shape magna tile designs would also make a nice addition to a math centre. And the pack of creative designs is simply fun to build with! 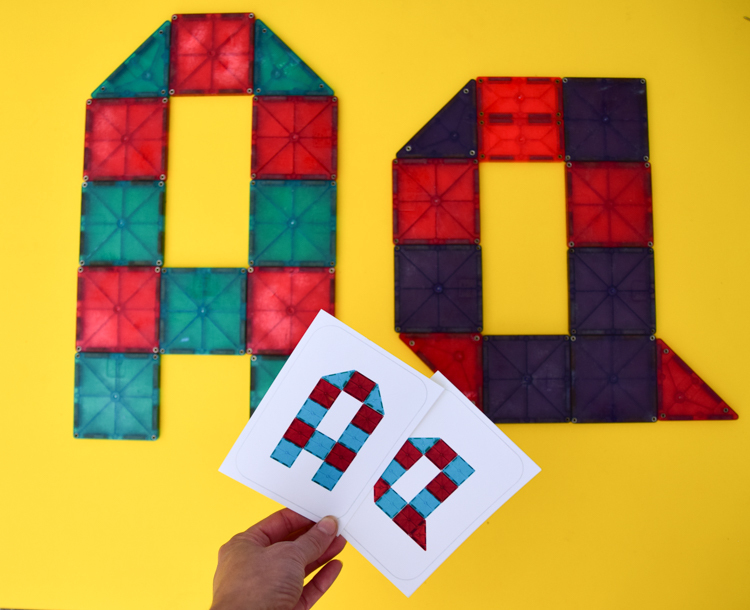 The designs on the cards are two-dimensional, but they give ideas for connecting the magnetic blocks in different creative ways that can be used in three-dimensional constructions as well. 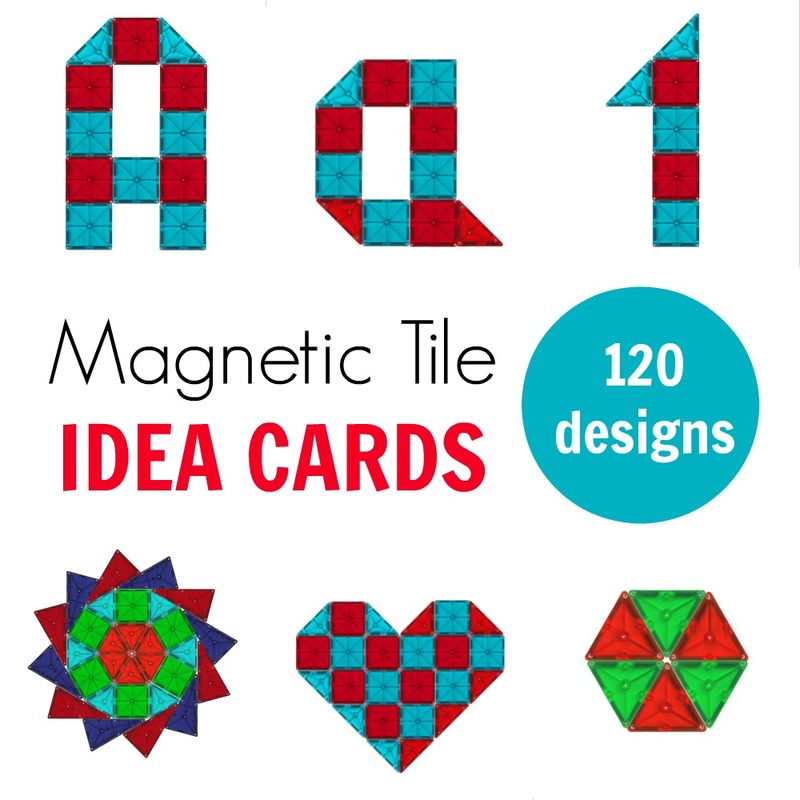 Why Use Magnetic Tile Idea Cards? 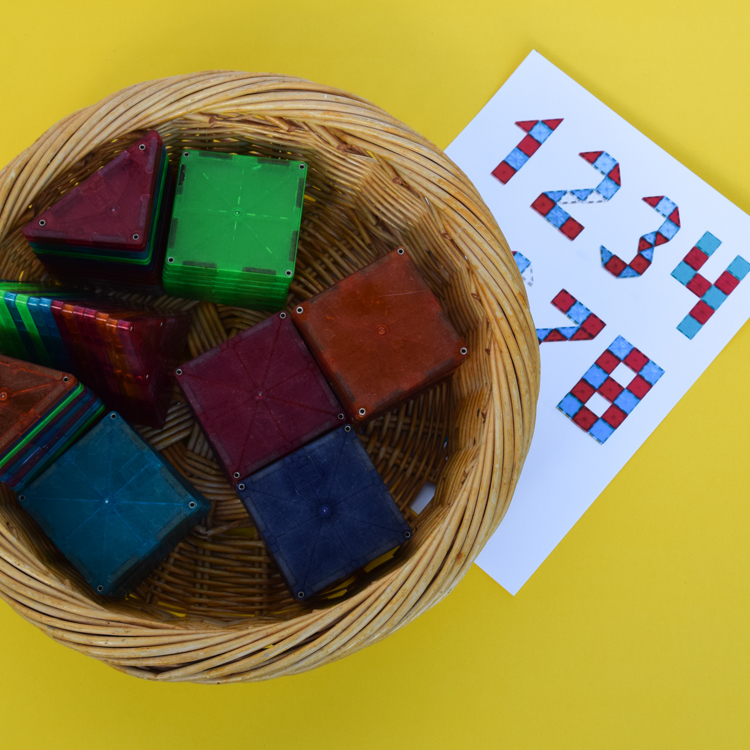 There is a bonus – two ways to build “4”, depending on your curriculum or preferred method! The Geometric Shape set is a little different than the rest of the cards. Other than printable cards with designs, it also includes challenge cards. Challenge cards give an idea of what shape to build and what tiles to use, but they do not show the design. For example: “Can you build a rectangle using four right triangles?” For children who cannot read, a picture of the shape is included. There is a “solution” card that can be either printed on the back of the challenge card or used alone for building inspiration, just like all the other Magna Tile idea cards. 2D Creative Designs was our favourite set to create. We made designs for a heart, a Ferris wheel, a butterfly, a rocket, a hot air balloon, a mandala, and many more! 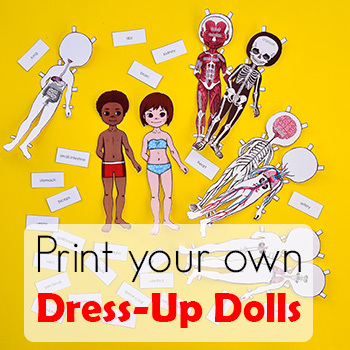 Some are simple enough that toddlers can work on them. 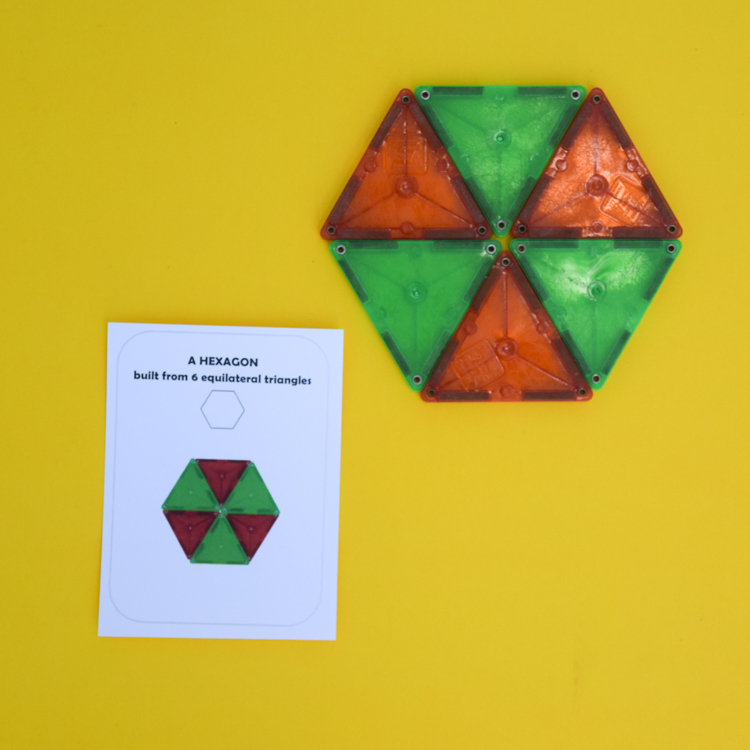 At two years old, my son loved repeating the magna-tile designs from the booklet that came with the toy. That booklet is long gone, though, so we wanted to make a set of our own designs for his little sister to recreate. But there are also some more difficult designs that will provide a little challenge and a lot of inspiration for older builders. Get All the Magnetic Idea Cards! 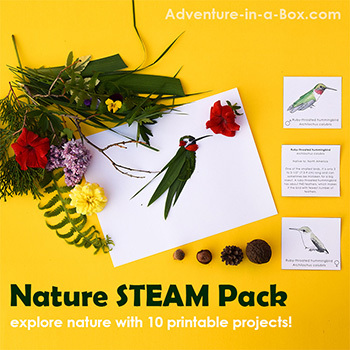 You can also try a free sample with two designs from each of the packs.